This past week I learned that May was Celiac Awareness Month. Upon discovering this, I thought how appropriate it was. May is the month that I decided to start my blog, the month in which Chris and I finally began to visit the GF restaurants in our city, and most importantly the month that I’ve really begun to get in touch with what this new lifestyle really means to me. In addition to helping me to feel well physically, being gluten-free has introduced me to a new way of eating, of thinking about food and the way I cook. I currently have over half a dozen different types of GF flour in my cupboard. Non-GF baking always has seemed (and still does) to me an untouchable science. I knew what each ingredient did, why it was important and that the way in which it was added was often even more crucial. The thought of straying from a recipe any farther than adding a new flavor extract or folding in a bag of chocolate chips, however, made me uneasy. Now, I can’t wait to experiment, to dive off the edge of recipes and transform them into something vastly different. I cannot wait to fail, to see my creations emerge from the oven imperfect so I can then contemplate what could be added or eliminated to make them better. Being a lifelong perfectionist, this is new ground for me. And it excites me more and more every day. I love finding myself in this, love redefining my relationship with food, and I love sharing it with all the wonderful people in my life. 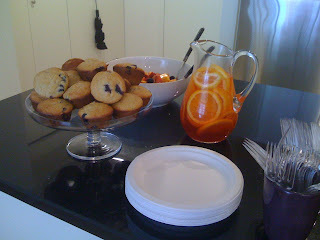 This morning we hosted a GF brunch to celebrate our little Nilla’s first birthday. As much as the gathering was for our deserving pup (she acquired many new toys and lots of delicious treats! ), it was also an opportunity to spend time and share food with a handful of our close friends. We started off with a bubbly, bittersweet Italian sangria, and a kiddie cocktail of sparkling lemonade with a splash of cranberry for the tot that was present. The edible spread included a delicious batch of Bob’s Red Mill GF brownies , GF blueberry muffins, chicken apple sausages, mini frittatas, and a salad of berries and stone fruit. I don’t think anyone missed the gluten. In a large pitcher, combine the wine, grapefruit liqueur and citrus slices. Refrigerate until ready to serve (can be refrigerated up to 2 days). When serving, pour the sangria into a glass and top it off with a splash of club soda for a bit of sparkle. In a medium bowl, combine all the dry ingredients together. Separately, in a small bowl, stir the lemon zest into the yogurt. In a large bowl, cream the together the butter and sugar. Add the eggs, one at a time, beating well after each addition. Next, stir in one half of the dry ingredients, mixing until combined. Then, add one-third of the yogurt. Continue alternating the dry ingredients and the yogurt until everything has been incorporated. Fold in the blueberries. Grease and flour (using rice flour) 18 muffin cups. Fill each cup equally with the batter and sprinkle with raw sugar. Bake for 30-35 minutes, until a toothpick inserted into the center of the muffins comes out clean. In a medium bowl, whisk together the eggs, egg whites, milk, a generous pinch of Kosher salt, and a few grinds of black pepper. Brush two mini muffin tins (12 muffin cups each) with the melted butter. In the bottom of each little cup, put a bit of the prosciutto and the parrano. Very carefully fill each cup the rest of the way with the egg mixture. Place the tins in the oven and bake for 10-12 minutes. Remove the pits from the various stone fruits and cut into bite-sized pieces. Place in a large bowl along with the assorted berries. Halve the orange and the grapefruit and squeeze the juice from each into a small bowl, using your fingers to filter any seeds. Whisk in the tablespoon of agave nectar. Pour the citrus-agave over the fruit, just enough to coat thoroughly. Toss gently and serve. This fresh, sunny, GF brunch was a lovely way to close the month of May. I feel a great satisfaction knowing that I’m walking away from Celiac Awareness Month more aware than ever of my own relationship with gluten as well as having spread awareness to many of my friends and family.